Smart-UPS® VT offers centralized three-phase power protection with the reliability of the award winning Smart-UPS family. 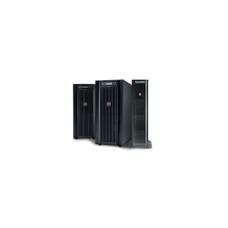 Ideal for small data centers, large retail stores, regional offices, and dense power requirements, the Smart-UPS VT includes dual-mains input, automatic and maintenance bypasses, and scalable runtime with hot-swappable batteries for increased availability. The rack mounted version maximizes valuable floor space by incorporating UPS, power distribution, and additional battery capacity in a single rack. Low cost of ownership is achieved through best-in-class efficiency and a reduction in rating of electrical infrastructure - wires, transformers, and generators due the Smart-UPS VT's Soft Start feature. The APC Network Management Card with temperature monitoring provides remote monitoring and management through a simple Web/SNMP interface and provides integration with InfraStruXure® Manager. Serviceability is greatly enhanced by user-replaceable batteries, manageable extended run frames and included start-up and standard onsite warranty services. All these features make the Smart-UPS VT the easiest UPS in its class to deploy, manage and maintain.